We are a non-profit and volunteer organization promoting Dressage in Nova Scotia and throughout the Maritimes. Everyone is welcome to join. R.I.D.E.R.S. was started by a small group of riders from Nova Scotia's south shore in 2001 and began by putting on some local events. Since then it has grown to include sixty to seventy members from all across the Province. We offer competitions, clinics and recreational opportunities to encourage education of horse and rider, and enjoyment of this great sport. 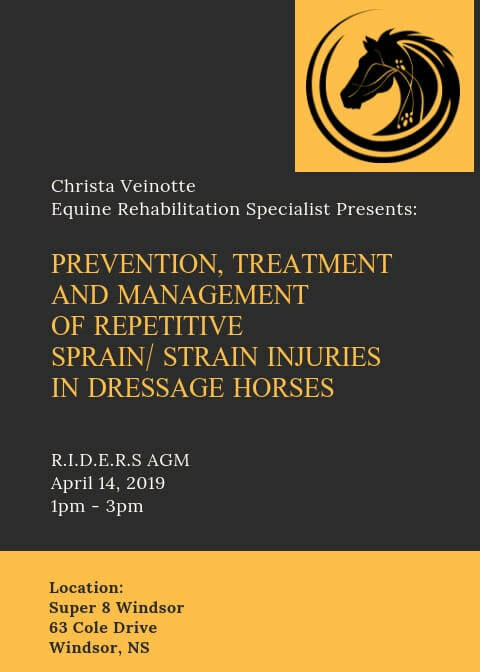 We are affiliated with the Nova Scotia Equestrian Federation and Equine/ Dressage Canada and are incorporated under the Nova Scotia Societies Act. The revenue from our memberships and events is used to run our shows and clinics.